Enhydra paludosa (Reinw. ex Reinw.) DC. Some compilations refer to Enhydra fluctuans as Enydra fluctuans. Some compilations consider Enhydra fluctuans Lour. and E. anagallis as synonyms; some as separate species. BENGALI: Hingcha, Helencha, Hinchashak, Harhach. VIETNAMESE: Cây rau ngổ, Rau ngổ, Ngổ trâu, Ngổ đất, Ngổ hương. Kankong-kalabau is a prostrate, spreading, annual herb. Stems are somewhat fleshy, 30 centimeters or more in length, branched, rooting at the lower nodes, and somewhat hairy. Leaves are stalkless, linear-oblong, 3 to 5 centimeters in length, pointed or blunt at the tip, usually truncate at the base, and somewhat toothed at the margins. Flowering heads are without stalks, borne singly in the axils of the leaves, and excluding the bracts, are less than 1 centimeter in diameter. Outer pair of the involucral bracts is ovate and 1 to 1.2 centimeters long; the inner pair is somewhat smaller. Flowers are white or greenish-white. Fruits are achenes enclosed by rigid receptacle-scales. Pappus is absent. - In the Philippines, found only in Rizal Province in Luzon and occasional along the banks of small streams in and about Manila. - Found in tropical Africa and Asia to Malaya. - Study yielded flavonoids, tannins and saponins. - Leaf extract study yielded two new chlorine containing melampolids, in addition to three known sesquiterpene lactones. - Phytochemical analysis yielded alkaloids, saponins flavonoids, triterpenoids/steroid, tannins, carbohydrates, and glycosides. - Ethyl acetate fraction yielded two flavonoids: baicalein 7-O-glucoside and baicalein 7-O-diglucoside. - Study showed low ash content and a good source of beta-carotene (3.7 to 4.2 mg/100g on fresh weight basis. - Study showed antimicrobial, analgesic, antidiarrheal, antioxidant, anti-cancer, CNS depressant, iron chelating, hepatoprotective, gastroprotective properties. - In Malaya, young parts are used as salad. - Boiled leaves and stems eaten with rice. - Sometimes steamed before they are eaten. - In the Philippines, leaves are pressed and applied to the skin as a cure for herpetic eruptions. - The Malays use the young parts and bitter leaves as laxative. - Leaves used for diseases of the skin and nervous system. - Leaf paste applied to inflamed breasts to reduce inflammation. - In Calcutta, fresh juice of leaves used as adjunct to tonic medicines; used for neuralgia and other nervous diseases. In Indian medicine, also used for various skin diseases and as a laxative. - In Assam, India, plant juices used for skin diseases, nervous disorders and high blood pressure. - Expressed juice of leaves used as demulcent in cases of gonorrhea; mixed with cow's or goat's milk. - As a cooling agent, leaves are pounded and made into paste and applied cold to the head. - Plant used for torpidity of the liver. Infusion is prepared the previous evening, boiled with rice and taken with mustard oil and salt. - In Ayurveda, used for liver disorders, skin and nervous disorders; also, as laxative. Anti-inflammmatory activity of Enhydra fluctuans Lour, Leaf. Plaban Bhattacharya, Anup Maiti, Subhash C. Mandal. The 9th International Congress on Ethnopharmacology at Naning, P.R. China. (2006). Hepatoprotective nature of Enhydra fluctuans leaf on Paracetamol induced hepatic damage / Plaban Bhattacharya, Anup Maiti, Subhash C. Mandal. The 94th session of the Indian Science Congress at Annamalainagar, India.(2007). Flavonoids of Enhydra fluctuans exhibit anticancer activity against Ehrlich's ascites carcinoma in mice. / Sannigrahi S, Mazumder UK, Mondal A, Pal D, Mishra SL, Roy S. / Nat Prod Commun. ; 2010 Aug; 5(8): pp 1239-42. Sorting Enydra names / Maintained by: Michel H. Porcher, / MULTILINGUAL MULTISCRIPT PLANT NAME DATABASE / A Work in Progress. School of Agriculture and Food Systems. Faculty of Land & Food Resources. The University of Melbourne. Australia / Copyright © 1997 - 2000 The University of Melbourne. Flavonoids of Enhydra Fluctuans exhibits analgesic and anti-inflammatory activity in different animal models / Sannigrahi S, Mazumder UK, Pal D, Mishra ML, Maity S. / Pak J Pharm Sci., 2011 Jul; 24(3): pp 369-375. 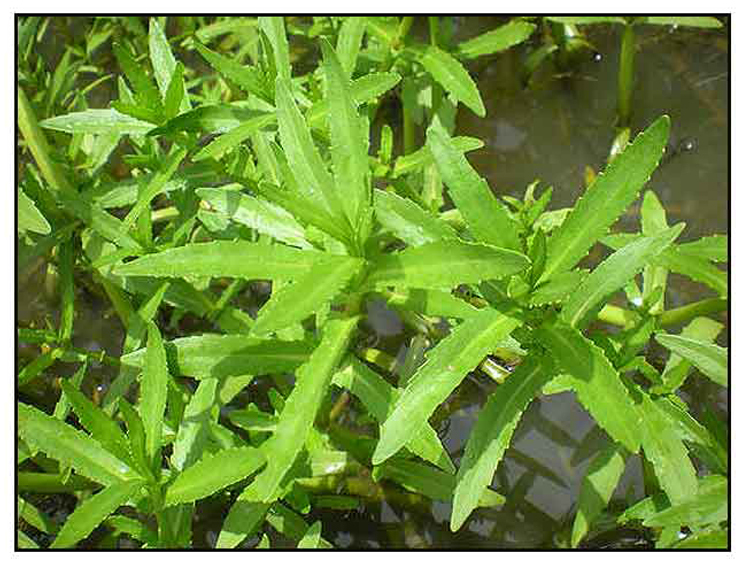 Chemical composition of two semi-aquatic plants for food use. / Dewanji A, Matai S, Si L, Barik S, Nag A. / Plant Foods Hum Nutr. 1993 Jul;44(1):11-6. Antimicrobial and cytotoxic activity of three bitter plants enhydra fluctuans, andrographis peniculata and clerodendrum viscosum. / Amin M R, Mondol R, Habib M R, Hossain M T / Adv Pharm Bull., 2012; 2(2): pp 207-211 / doi: 10.5681/apb.2012.032.